Meet Lolly and Joey, our offspring. "Lolly" was one of Dory's last puppies. She is Black & White in color and weighs just under 4.5lbs. She was born with a heart murmur and may have a shortened life. She gets tired faster and a little short of breath when playing hard. She looks an awful lot like her mom. 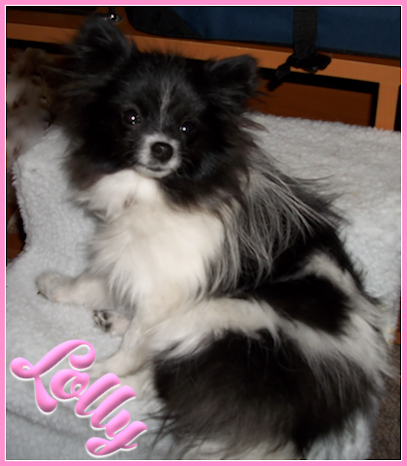 Lolly dearly loves to play with Cinni Mini and Joey. They play a game of chase that is awesome to watch. She has a large white question mark in white on her left hip. On her back is a small white bone shape. both bones just above the wrist. Returning him to health required major surgery to put pins through the bones and lots of Laser treatments to help the bones heal better. I am happy to report that he is well and happy once again. 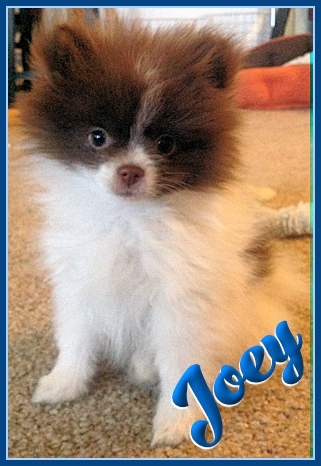 There are more pictures and even some video of Lolly & Joey in the Gallery and Video sections.